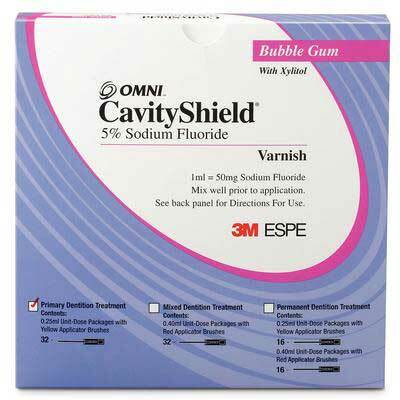 3M ESPE offers CavityShield, a unit-dosed 5% neutral sodium fluoride varnish. The unit-dose feature provides the ability to mix the fluoride varnish, which naturally settles, before application. CavityShield dental varnish is available in a pleasant bubblegum flavor. Two dosage sizes are available for patient safety, which are easily identified by color-coded brushes.